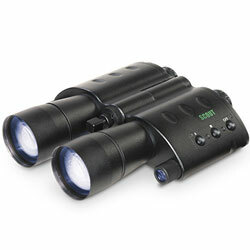 The ATN Night Scout night vision binoculars come with many fantastic features that make them ideal night binoculars for many uses including night safaris and wildlife viewing, camping, nocturnal bird watching, hunting, marine use and security. The main features include a high resolution 1st Gen Intensifier Tube which gives you a light amplification of 35,000, a 5x magnification which is very impressive on nightvision binoculars, Smart Digital Technology where the on board computer systems automatically turn the binoculars on when you bring them up to your eyes and turn off when you take them away, saving battery life. 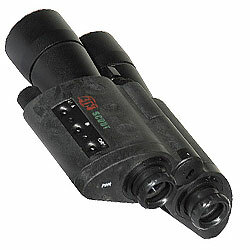 A built in Infrared illuminator is a common feature on many Night Vision (NV) devices these days which was pioneered by ATN (American Technologies Network Corp.) and these binoculars include a very powerful long range IR illuminator that enable you to use the binoculars even when there are no other light sources like the stars or the moon available. They also have a bright-source protection to the intensifier tubes that protects them when exposed to bright light such as car lights or room lights. The multi-coated 90mm glass lenses allow for optimum clarity and distance and aluminum alloy construction of the body is not only lightweight, but also tough and make a good choice if you need a rugged and reliable pair of night-vision binoculars. Cheap Night Vision: Overall as a Gen 1 night vision device, the ATN Night Scout is popular in many night vision reviews and is one of the best selling night vision binoculars on the market. With superb performance and high quality images and with may other brands of NV binoculars costing much more for the same or fewer features it is easy to see why. Also called IR illuminators, they are now common on most quality night vision equipment. The IR light greatly enhances the performance of the Night Scout binoculars while remaining almost totally invisible to the naked eye. The IR illuminator on the Night Scout is located on the side of the binoculars, to turn the IR on, you just need to turn on IR button. Whilst the IR is powerful on these binoculars, it is important to remember that it is simply an infra red light source and like any light source it may loose its efficiency over long distances. You can use your Night Scout with a 35mm camera or camcorder by using the optional camera adaptor. Your camera must have a MACRO feature although most modern camcorders today have a MACRO feature built in, but it is worth checking first. If you are using a 35mm camera you will need a MACRO lens which you can get from most good camera stores. All you need to do is screw the camera adapter onto the front of the lens on your Video camera�s lens or your 35-mm camera�s lens and place the camera adapter over the Night Scout�s eyepiece. Then focus the 35mm camera or video camera in combination with the Night Scout in order to get the sharpest possible image an important point to remember is that you are not taking a picture of an object that is far away from you, but you are actually taking a picture of a phosphorous screen of the Night Scout that is only 2-3 inches away and that is why you need the MACRO feature or MACRO lens on your camera. You may also need a STEP-UP or STEP-DOWN ring in order to adapt the camera adapter to your lens. The camera adapter comes with 37-mm and 52-mm threads, if you need other sizes your local camera store should be able to help. Whilst Gen 1 devices offer excellent bang for your buck and because of their low cost (or should that be the very high cost of Gen 2, 3 and 4 night vision equipment), 1st generation night vision devices are the most popular choice for most people outside of the military and law enforcement forces, they do however have some shortcomings when compared to the higher generations. They amplify the existing light several thousand times letting you clearly see in the dark, giving you a bright and sharp image, but you may notice some inherent characteristics of a 1st Gen devices that are normal and nothing to worry about, but include a very slight high pitched whine when the device is on and the image you see may be slightly blurry around the edges, this is known as Geometric Distortion. >> Read more on Night Vision Generations. Field of View: (FOV) 20 deg.